The six-day module format is a wonderful opportunity to deepen your process of self-exploration, and to directly experience the healing potential of non-ordinary states using Holotropic Breathwork. You will meet like-minded people from around the world, and explore together in a safe and supportive environment. You will also learn tools and techniques for living a more creative and fulfilling life, and will have extensive personal contact with some of the best Holotropic facilitators in the country. Each six-day module includes four Holotropic Breathwork sessions – participants will experience two sessions as a ‘breather’ and two sessions as a ‘sitter’. In addition to experiencing Holotropic Breathwork, both topics explored in these two modules are especially relevant for anyone working with others in non-ordinary states of any sort for transformation and personal healing. 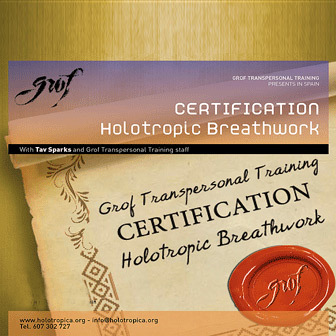 These modules are open events and suitable for both participants interested in the training program and for those interested in the adventure of self discovery for personal growth.Website of Grof Transpersonal Training and Holotropics. Holotropic Breathwork with Tav Sparks, Diane Haug, and others. Lectures, Workshops, Retreats; Books by Stanislav Grof and others; Music. We offer workshops and training in Holotropic Breathwork.